The SAM C21 family of devices includes a Sigma-Delta Analog-to-Digital Converter (SDADC), which converts analog signals to digital values. 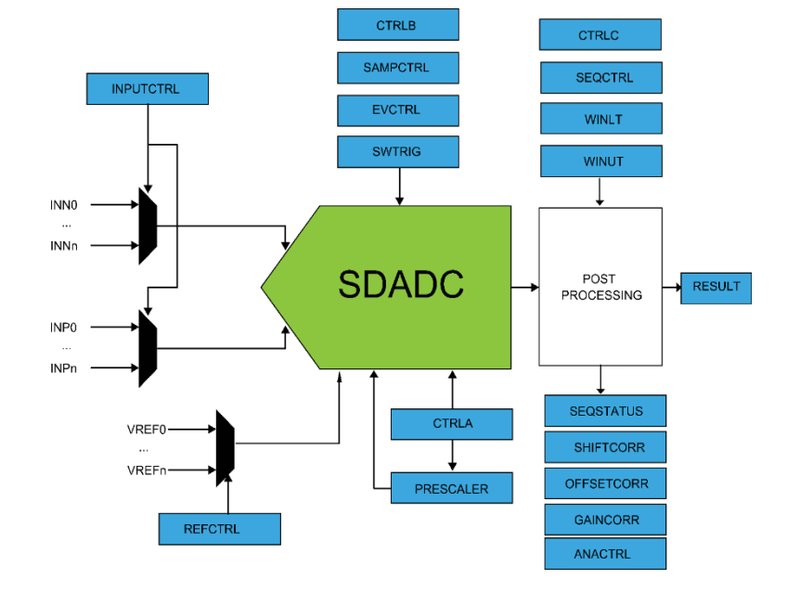 The SDADC has 16-bit resolution, and is capable of converting up to 1.5 Msps divided by the data over sampling ratio (OSR). The input selection is up to three differential analog channels. The SDADC provides signed results. ADC measurements can be started by either the application software or an incoming event from another peripheral in the device. ADC measurements can be started with predictable timing, and without software intervention. The SDADC also integrates a sleep mode and a conversion sequencer. These features reduce power consumption and processor intervention. A set of reference voltages is generated internally.